All recordings by Paul Williams @ SANTA POD, Podington, England on May 29, 31 & July 3 1999 All photographs by Jeremy Larkin (jplark23@hotmail.com) Mastered by Denis Blackham @ Country Masters, Frimley, England on July 26th 1999 Scans by Orange Communications Ltd with thanks to Mark Blacklock, Katie Lundy and Esther Owen; Keith Bartlett and Caroline Day at SANTA POD Raceway, and the commentators, Graham Beckwith and Paul they are men of our times. 1999 marks the 50th year of drag racing, after the first official meeting was held in 1949 on the streets of Goleta in California. Then, the quarter of a mile course took 11 seconds with the vehicles travelling at over 150 mph. Now, they race at over 300 mph, taking just 4.5 seconds. The vehicles are completely purpose-built and represent the extreme fringe of non-commercially motivated technological research. 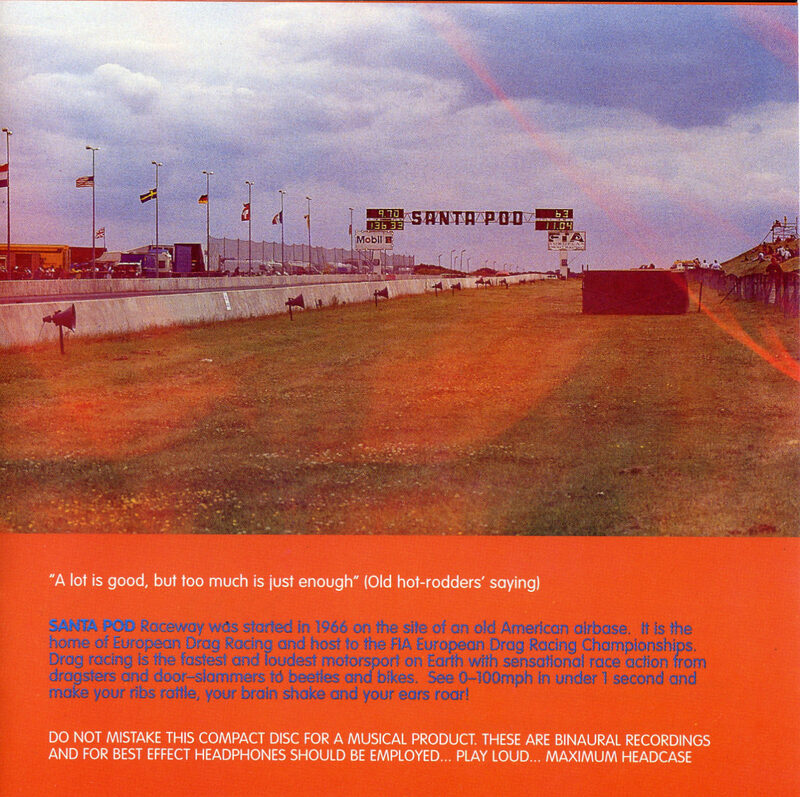 Santa Pod Raceway was started in 1966 on the site of an old American airbase. It is the home of European Drag Racing and host to the FIA European Drag Racing Championships. Drag racing is the fastest and loudest motorsport on Earth with sensational race action from dragsters and door-slammers to beetles and bikes. See 0-100mph in under 1 second and make your ribs rattle, your brain shake and your ears roar! This CD captures all the thrills and spills of Drag Car Racing – an activity at the cutting edge of technology. For fans and audio buffs alike, use this CD to recreate the awesome power in your own living room, or frighten the daylights out of the dancefloor by using this as a DJ tool. Monster! Monster! If the roar of jet engines and the smell of burning rubber on asphalt grabs your senses, then drag racing is the sort for you. The only place to witness it professionally in the UK, however, is at Santa Pod, a disused US air base outside London that during the summer months plays host to some of the world’s fastest machines on four wheels. The big sound of the drags has now been lovingly caotured by PAUL WILLIAMS on Santa Pod, an aural documentary of a day at the drag races that captures the heart-fluttering adrenaline-rush of being in the grandstand when a Top Fuel dragster lets rip with ear-splitting intensity. Beyong rock ‘n’ roll (and even Japanoise! ), drag racing in the raw is a sound that will flood you with fear and joy. Suffering from those drag racing withdrawal symptoms already? Wondering where your next fix is coming from? Then fear not because self-confessed drag racing and ‘noise’ fan Paul Williams has come to the rescue by producing an audio CD of racing sounds. Your lounge can now become the startline of Santa Pod Raceway to soak up the complete sounds of a day at the races. Captured at the Main Event and Cannonball race meetings, Paul wandered far and wide with the latest in high-tec recording equipment, and has edited together an hour or so of the best of the sound action. As you would expect the CD contains the sounds of a range of cars and bikes recorded from all parts of the race track, but bonus tracks include crews working in the pits, conversations on the spectator bank, and highlights from the repetoire of track announcers Graham Beckwith and Paul Venners. Enjoy with the sound at maximum rpm!